Greg and Katy at the State FFA Convention. Our son, Kody, receiving his State Farmer Degree at the FFA Convention. Then came two physicals for Greg one for his DOT CDL license and then another for his yearly preventative health checkup. He passed both but it took about a good 6 hours between the two and waiting in line and at the labs. Then it was on to OKC for Greg and Mary Wednesday evening to watch Kody receive the State Farmer Degree. It hits home when you watch your firstborn go across the stage getting that degree, knowing that he’s grown up and you’re getting old! Then after spending the night in OKC, it was back to Tulsa to pick up parts and home to work again. when Kody graduates from high school. Sunday we once again tedded the hay. 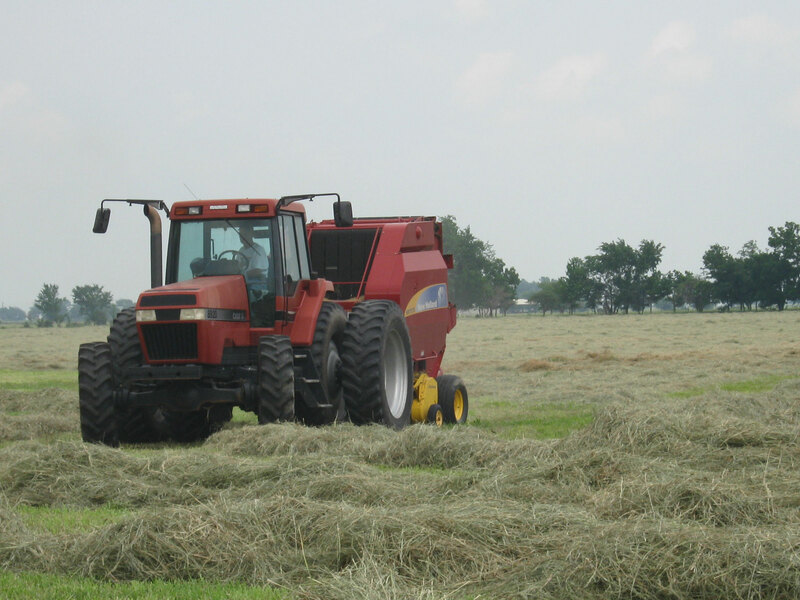 Then after lunch we raked the hay followed by baling. We got done just before dark. Our timing was great as it rained later Sunday night. Hay we wrapped up over the weekend. 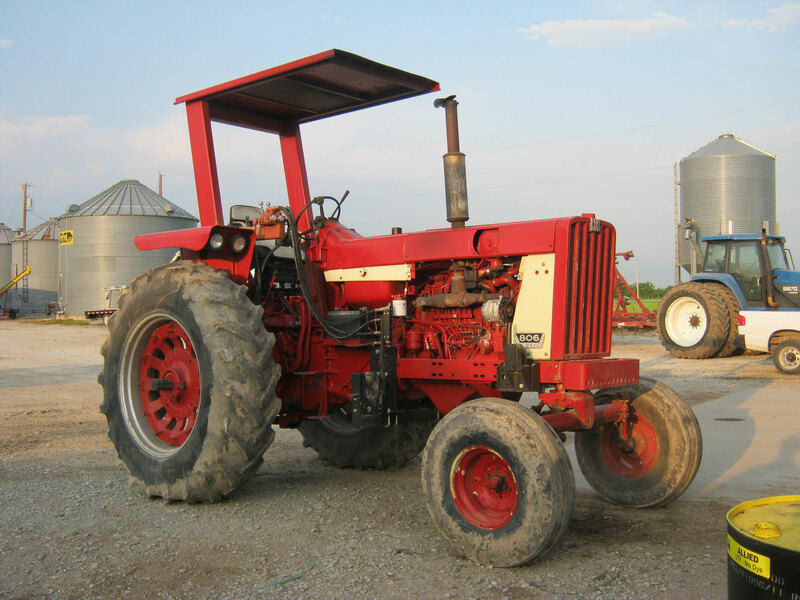 One of the many tractors we use on the Leonard farm. didn’t get a good stand due to too much water in the fields at times. 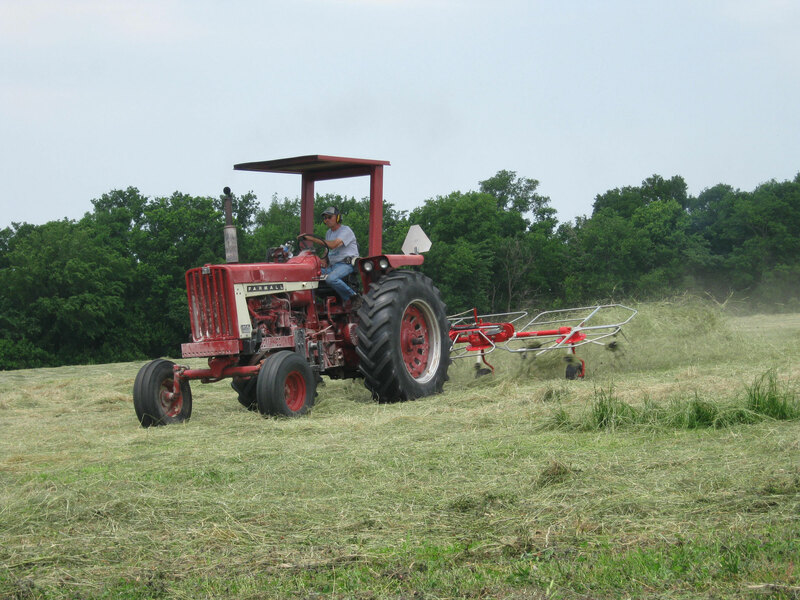 Many neighbors have or are baling their first cutting of fescue hay and we will do ours next week. 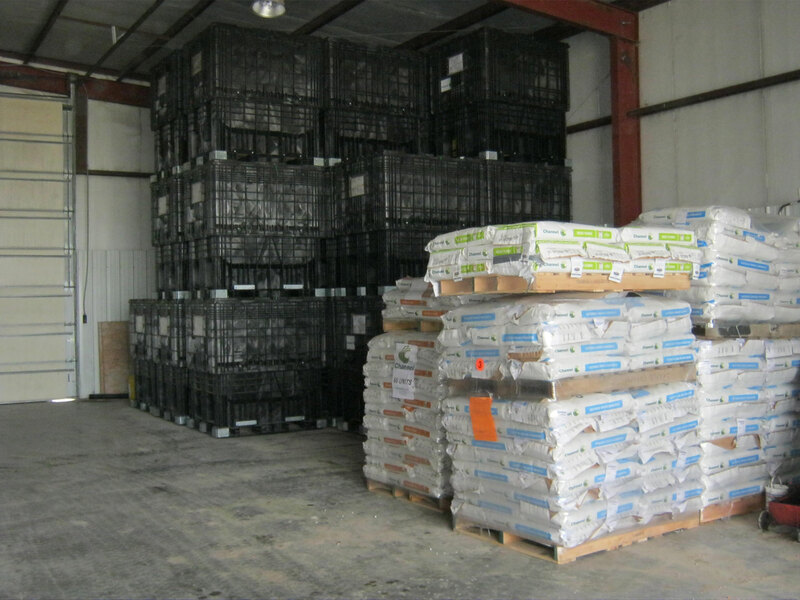 It's a busy time of year trying to keep up with the supply for our seed business. overdrive this week with the shipping of soybean and milo seed. We have unloaded 6 semi loads this week with two more due the first of next week. For every load we get, we then have to either unload it at a farmers farm or unload it here, break it into smaller orders, and then have the farmer pick it up or take it out to their farms. All this has to be done as we keep our other stuff going while making room in the warehouse to keep floor space for the next load coming in. 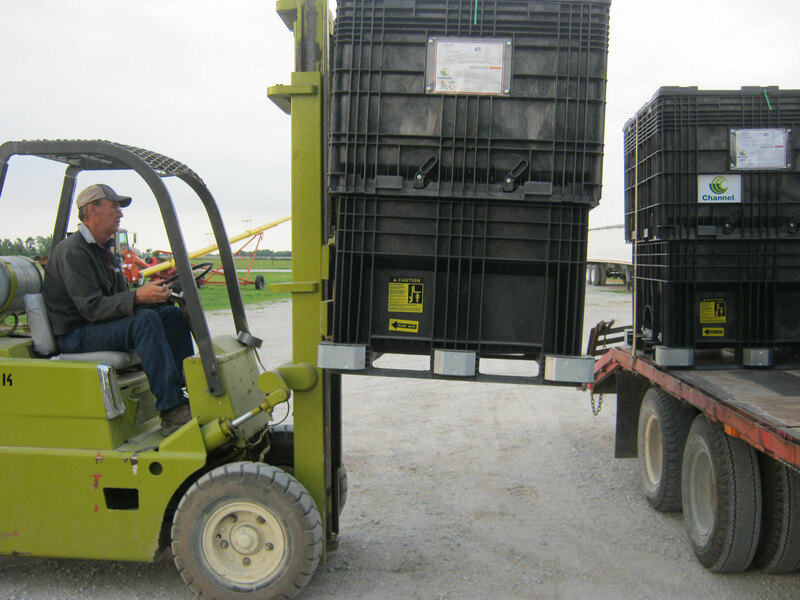 Greg moving seed back and forth to our customers. Maintenance on our new lease ground. that didn’t sell. 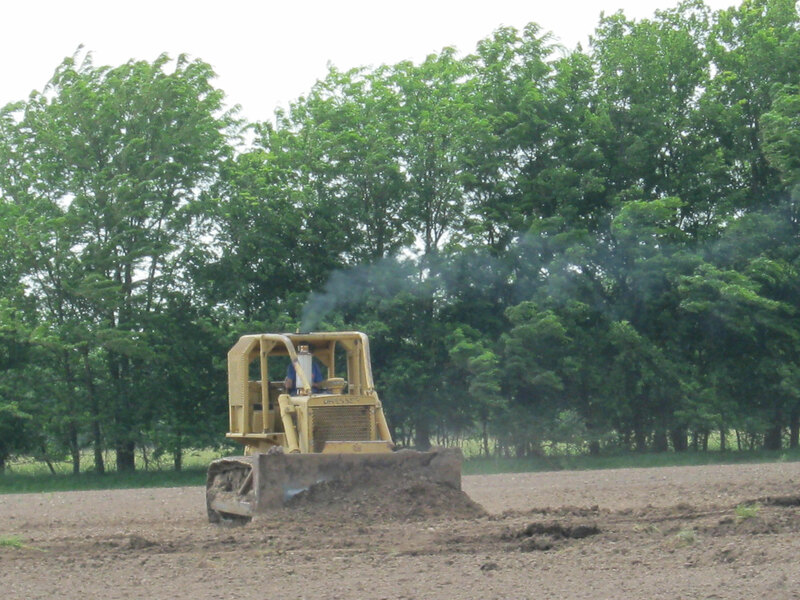 So with new ground it means soil sampling, fixing drainage issues (moving dirt with the bull dozer and scraper), getting the weeds that have grown so far this spring under control and ordering more seed to have to plant the ground. 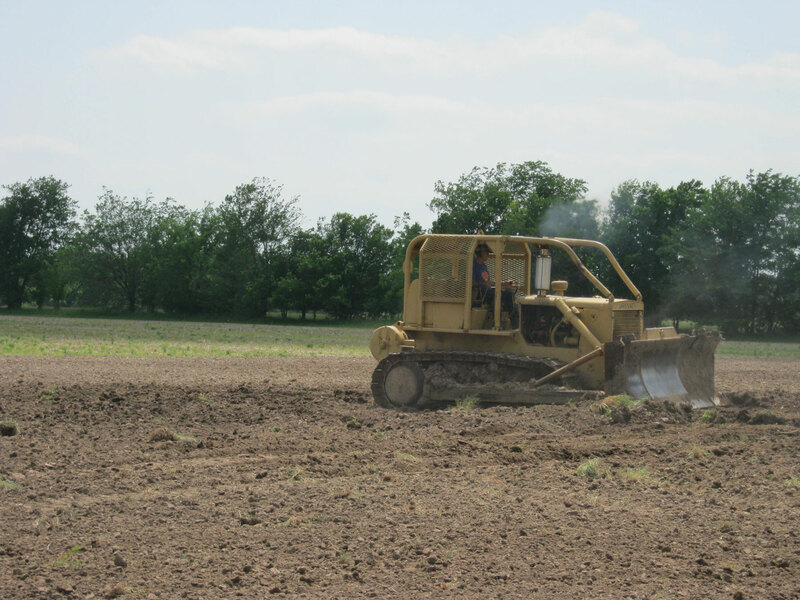 It take some bulldozing and scraping on our new lease land to prepare it for crops. Another item taking some time this week has been the movement of a farm bill in the senate Ag committee. The Farm Bureau farm bill committee has been trading phone calls and emails almost daily since last week when our chairmen testified before the house Ag committee in Dodge City, Kansas, to when the bill got voted out of the senate committee this week. Its been a real honor to work with this group of men and see the respect that our elected officials have for the Oklahoma Farm Bureau and how closely they have wanted to work with us on the farm bill. Kody and Katy have been busy with Crop Judging contests, track meets, prom and Kody with his graduation stuff and preparing his valedictorian speech. They also feed their animals (which grew by two this week with two new FFA sheep) and helping dad sort seed, fix tractors, check our cows and keep the neighbor bulls on their side of the fence. Mary has been busy with spring follies this week at her school, helping her mom now back in Vinita with her rehabilitation, and keeping all of us in place and on time for all of our meeting and contests. Another busy week here in northeast Oklahoma. I have finished my corn planting and all but one of my custom planting jobs. We are only 90 acres from being done there but it showered again last night so waiting for it to dry up again. I have planted 1400 acres of corn for me and my customers since starting almost a month ago. The first planting had to be done over after the rain so more fuel, time, and seed had to be invested to get the same results at harvest, or we hope so. The kids were busy with more crops judging contests for FFA this week, winning second place team and in the top five at most contests. I’m proud of them and the work they are putting into the contests with a goal of repeating as state champions at the state contest like Afton did last year. Kody hopes to repeat his high individual win again at state contest like he did in 2011. Time will tell if their hard work pays off. Mary has been very busy with visiting and helping her mom, who is still in the hospital in Tulsa. It looks like we will get to see her come back to Vinita next week. This week as I was planting, I set back and was amazed at the technology that we now use in our machinery. I hope some of the pictures help you see what I’m talking about. My tractor drives itself and will put me back within 1 inch of the same place any time I return to that field with the RTK and auto steer system. All I have to do is get it to the field, load the stored pattern I want it to follow, and then turn it around on the end rows and hit the button. It drives itself in a straight line or a curved pattern back to the other end of the field. My grandfathers both would have been so amazed to see that work, and my son Kody thinks the tractor is broke down and can’t run if the system fails and you have to actually drive the tractor!! What a difference in generations. Driving is not the only thing the computer controls. It turns the planter on and off, row by row as we cross over any area of the field that has already been planted, thus saving me lots of seed and dollars, which can add up very fast when corn seed costs $300/bag nowadays. 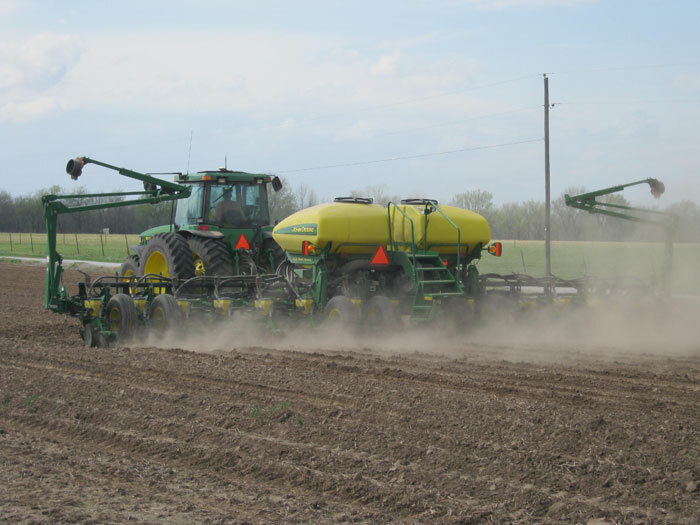 I can also monitor every row of the planter telling me how many seeds per acre it is dropping and the spacing between seeds, and then I can use that information and change the rate at which the planter is planting – all from inside the cab. All this information is being recorded along with what variety I’m planting, the date, the speed, and any other information I want to put in for future reference either back on my computer in the office or later in the combine when we are harvesting the crop and laying our yield maps over our variety maps as we harvest the grain. I have seen a lot since I started farming with no cab tractors to today, and it just makes me wonder what Kody will get to see if he decides to make farming his occupation. We’ll see you all next week and hope we can show pictures of rows of nice green corn and Katy showing her heifer in the first stock show of our year. The RTK system in my tractor. My RTK and auto steer systems. Auto steer technology eliminates the need for me to physically use the steering wheel. One of our wheat fields after a spring storm. 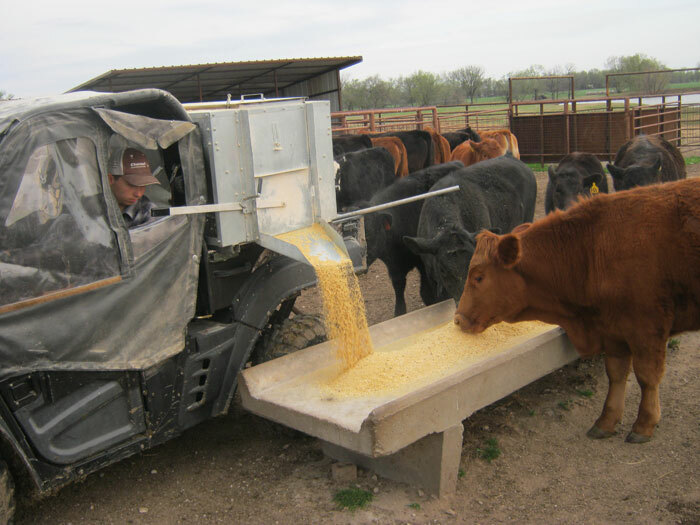 Kody feeds cattle in the rain. practices and my meetings. 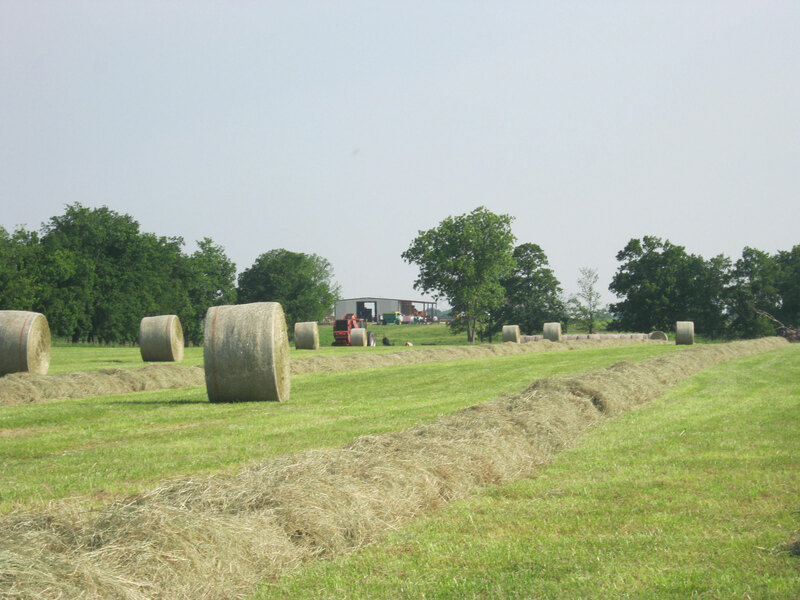 As with all farms in the area, the warm weather has brought green grass to those that have fertilized their pastures after last year’s drought. We are most likely on our last week of feeding hay to our cow-calf operation. With this week being spring break, we plan on working and moving cattle around this week so that they have had their shots and are wormed – ready to take advantage of the green grass we now have. We will still have to bring them back later in May to fly tag and give booster shots to the calves. 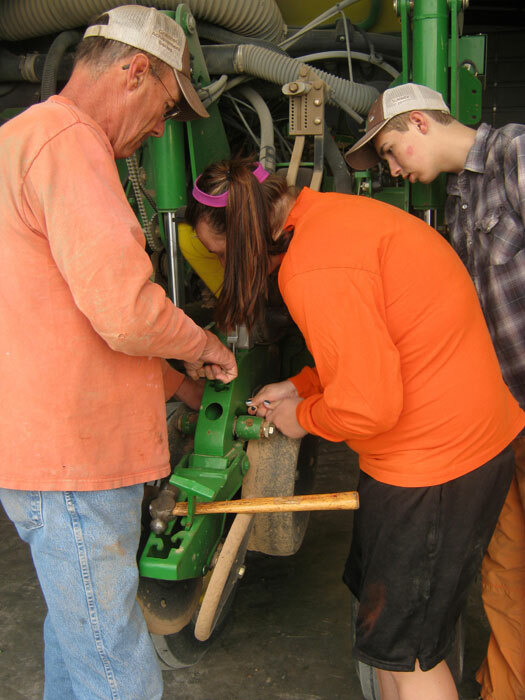 Kody and Katy help their dad, Greg, on the farm during spring break. Greg planted a couple fields of corn last week in anticipation of the rain. 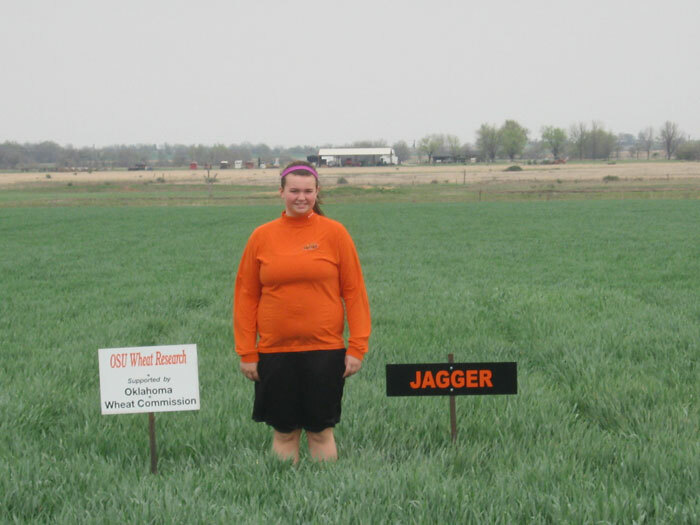 The wheat Katy is standing in will head out in about one week. planted in a timely matter so that it can grow and mature before the summer heat, and if you don’t plant and it doesn’t rain then you have lost valuable growing time. Welcome to farming 101 – it’s always a gamble, just a very high priced one these days. We had great news this week for Kody. He won the Ottawa County Farm Bureau scholarship after being interviews last Tuesday. It was a very tough competition with his good friend from Fairland being announced as the runner up.